Birds can be a source of enjoyment and pleasure for some, while some birds, such as pigeons, can become a bothersome nuisance when they make themselves too comfortable on ledges, eaves and overhangs. Pigeons are an example of wildlife that poses a growing bird control problem and health concerns for homeowners and businesses. Pigeons roost in roof voids and other protected areas and are adapted to living with humans, often depending on close contact with humans for food as well as roosting and nesting locations. Pigeons are of medical concern because then can cause more than 50 diseases and ectoparasites, including the spread of cryptococcosis, toxoplasmosis, salmonella and food poisoning, among others. Pigeon droppings (guano) are unpleasant and can be hazardous, causing slips and falls as well as harbor the fungus histoplasmosis, which contributes to lung disease. Other pests thrive on birds, such as fleas, lice, mites and ticks. Pigeon droppings are acidic and can discolor buildings and deface surfaces and car finishes. Pigeons nest in undisturbed and protected voids. To prevent or eradicate pigeons, AmeriGuard Pest Defense’s bird experts will make roosting and nesting areas inhospitable. 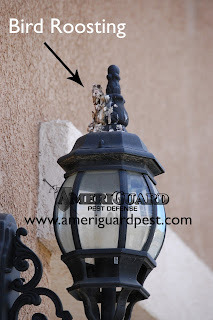 At this time, AmeriGuard achieves bird control by mechanical methods that modify the structure. 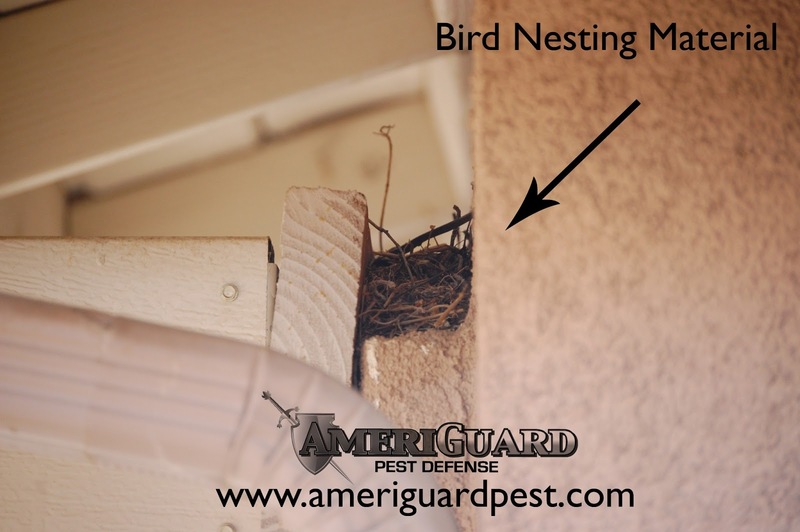 These bird control methods may include: netting, metal wire, bird spikes and metal flashing. Filling in access to voids, sloping resting areas with metal flashing and preventing landing by using devices will help control an emerging or existing bird problem. All materials will be primed and painted to match existing structures and blend in as effectively as possible. 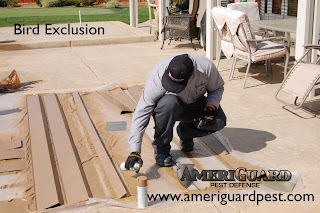 Metal flashing is painted to match exterior structure. As mentioned above, bird droppings can contain disease that can affect humans. It is important to treat the contaminated areas and nesting sites with a sanitation service. AmeriGuard is able to provide this additional service for bird control situations. 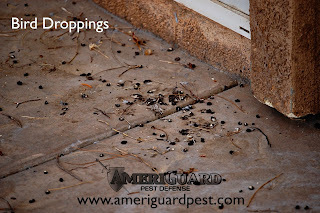 Bird droppings should be sanitized and disinfected. Pigeon Infestation in Riverside County? 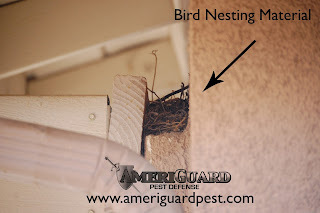 If you are concerned with an ongoing or emerging bird infestation that is causing unsightly droppings, potential health hazards and noise concerns, contact your local licensed bird experts at AmeriGuard Pest Defense today for a quote or to schedule an inspection by calling (951) 652-0505 or submitting an online request.